What really happened up there? 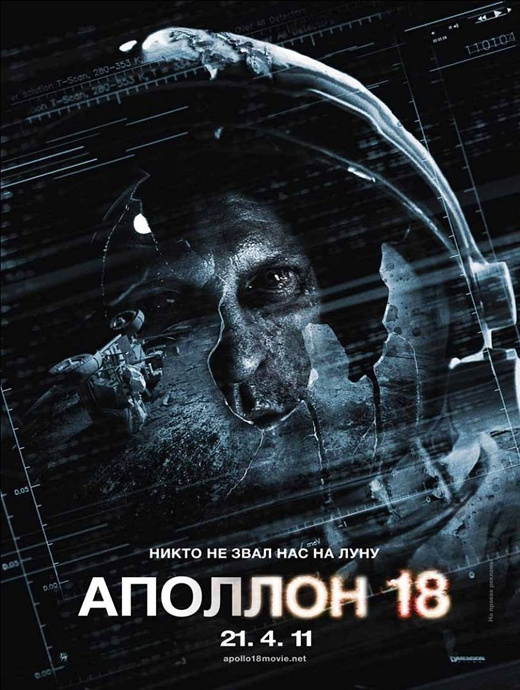 A new Russian poster for The Weinstein Co's found-footage science fiction thriller Apollo 18 has been discovered via IMPAwards and I had to share it with you guys. We just saw the official trailer a couple of weeks ago and there's a viral still afoot, so buzz is still building for this sci-fi flick. That also makes me wonder - maybe this is just a US poster in Russian, almost as a weird viral poster. Don't they find another Russian ship in the trailer? Also, the viral recently revealed more mysterious documents, which may have some clues to help put this all together, too. Either way, check out how eerie this poster is. A film about the real Apollo mission to the moon in the 70's that was canceled by NASA… or so they claim. Apollo 18 is directed by Spanish editor/filmmaker Gonzalo López-Gallego, of a few features like King of the Hill and Nómadas previously, who is making his English-language debut with this. The original screenplay was written by Brian Miller (Paracusia) & Cory Goodman (Priest). Russian filmmaker Timur Bekmambetov also produced this in secrecy at Dimension Films. The Weinstein Company will be releasing the mysterious Apollo 18 in theaters everywhere starting on April 22nd this spring. Anyone else freaked out by this? yeah, same here lol. Cloverfield was awesome to follow. Now THIS is a horror movie poster. Maybe the aliens are the Russians! And the only way to save Earth is for Patrick Swayze's ghost to come and kick their asses. I reckon it'll be a good enough film, just think maybe the trailer ruined most of the plot points. But people are stupid, or at least Hollywood thinks people are stupid so the trailers reflect that. it looks like the unseen prologue to Nigel Kneale's The Quatermass Experiment.